GeForce Now for Mac could revolutionize gaming on macOS. Macs have already come a long way when it comes to gaming but GeForce Now promises to take it to another level blurring the line between gaming and Mac on PC like never before. The only concern is how it will be priced. It's hard to see a pay-as-you-go model being successful but if NVIDIA choose a subscription model, it's sure to be a runaway success. It’s not often that an app is released that completely blows you away but it’s no exaggeration to say that GeForce Now For Mac is a potential game changer on Mac – quite literally. GeForce Now blows them completely out of the water. Even better, for a limited period, GeForce Now Mac Beta is free to use so we took it for a spin to see how it’s set to revolutionize gaming on Mac. If you’re in a hurry, you can watch a good overview of how GeForce Now performs on a Mac below. As you can see, it’s incredibly easy to use and performs flawlessly even when playing demanding games such as Doom and Overwatch. If you’re a long time Mac user, you’ll know that Mac users are always back of the queue when it comes to games releases. For obvious reason, most developers concentrate on the PC and gaming console markets and big games are always released later – and in many cases never – on Mac. GeForce Now changes all of that because by hosting games in the Cloud, it allows Mac users to play PC games as soon as they’re released on Steam or Blizzard, at the same frame rate and resolution as high-end gaming PCs with absolute ease. Even more impressive, you don’t even need a new or high-end Mac to do so. We tried it on a 5-year-old MacBook Pro and there was absolutely no difference between playing games on it compared to a state of the art gaming PC, even at 60 fps and ultra high-resolution settings. At the moment, GeForce Now For Mac is in beta but you can request beta access to see if a slot is available in your region. You have more chance of getting an invite if you sign-up according to your region. To do this, go to the NVIDIA website, select your region and then search for “GeForce Now”. Then simply click on Request Beta Access to sign-up. Currently, the most common ways of playing PC games on Mac is by installing Windows on Mac via Boot Camp or using a virtual machine such as Parallels. Both however have their limitations especially when it comes to frame rates, resolution and stability GeForce Now is a far superior solution because it works by running a powerful GeForce GPX CPU in the Cloud. The GeForce Now client for Mac simply connects you to this and hosts games remotely but there’s absolutely no lag as the GeForce Cloud Servers take the heavy load off your Mac so that you can enjoy the game at its maximum settings. The only thing you really need is a decent internet connection (see system requirements below). One of the most remarkable things about GeForce now is that it works perfectly on older MacBooks (both Pro and Air) and iMacs. We tried it on a 5-year-old MacBook Pro from 2012 and it worked flawlessly even at 60Fps but according to the GeForce Now system requirements, it even works on MacBook Airs built back in 2009 and MacBooks built-in late 2008 – that’s almost 10 years old! You will need a minimum of 25Mbps download speed but 50Mbps is recommended. You can test your internet speed connection at speedtest.net. or GeForce Now will automatically detect your network settings and indicate whether you suffer from stutter or latency issues. There’s already a pretty impressive example of one user playing Just Cause 3 on a 27Mbps connection at 1080p. There is also an insane example below of a MacBook tethered by mobile phone in the middle of nowhere using GeForce Now almost seamlessly. 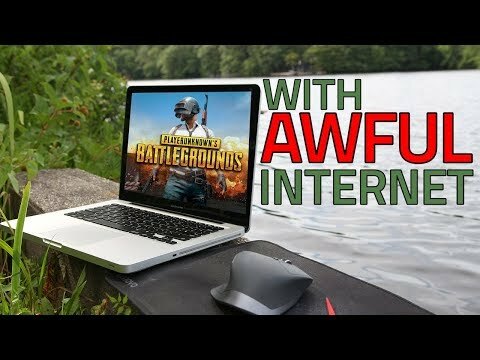 It’s clear the service is clearly incredibly flexible even when performing on slower internet connections. You’ll need a 5Ghz wireless router or preferably an ethernet connection. The problem with the latter is that new Macs don’t have an ethernet port but you can use one of these supported ethernet adapters. You will need to be running macOS 10.10 or higher. If you want to play at ultra high 200+ FPS and don’t have an iMac, you’ll need a 5K monitor too as MacBook’s don’t support 5K. Apple recommends the LG UltraFine 5K display for connecting to MacBooks. Note that you’ll need at least a MacBook Pro from late 2013 or earlier to use this display. Which Games Work With It? At the moment, the Mac version of GeForce Now only works with any game on the Steam or Battlenet platform although currently there are only a selected number of games which are optimized with Optimal Playable Settings for GeForce Now. This means that they install in seconds, you can save your progress and they play at maximum resolution and frame rate. These include major titles such as Fallout 4, Resident Evil 7, Civ VI, League of Legends, NBA 2K18 and it allows you to play Cuphead on Mac. However, you can still play other major titles such as GTA, Call of Duty and Assassins Creed but they are not optimized for GeForce Now, take longer to install, you can’t save your progress and you have to completely reinstall them if you want to play them again later. You can though request for new games to be optimized and added to the supported list so that they’re fully optimized for GeForce Now. Note that some apps such as VRChat are not listed as officially supported by GeForce Now but do actually work so that you can use VRChat on Mac. Once you launch GeForce Now, you’ll need to log into your Steam account in order to play games and you’ll need to have already purchased the games you want to play in Steam. NVIDIA are constantly adding new optimized games to the catalog and you can find out the latest ones that have just been added on the NVIDIA GeForce Now forum. Note that there is no limit to storage space on GeForce Now servers – you can install as many games as you like. GeForce Now Beta for Mac is completely free to use for now although it will kick you out after 4 hours of gaming. However, it will eventually turn into a pay-as-you-go service whereby you effectively “rent” the Cloud servers for blocks of time while you play but there is no official confirmation of pricing yet. When the service was originally premiered at CES 2017, NVIDIA said that gamers would get 8 hours for free and then it would cost $25 for every 20 hours of gaming on a GTX1060 Cloud setup and $50 for 20 hours on a GTX1080 setup. However, this still hasn’t been confirmed by NVIDIA yet. If there’s any drawback to the service, then it will be the pay-as-you-go pricing structure because as any gamer knows, it’s very easy to get lost spending hours gaming which is going to seriously add-up with a pay-as-you-go structure. It would be much better if pricing were on a subscription or annual basis so that gamers don’t feel restricted by how much they can play. There’s no doubt that gamers are more far more likely to pay $25 per month rather than pay by the hour and the pricing model for GeForce Now could be what ultimately makes or breaks it. It’s currently limited to the US and Canada with a worldwide roll-out expected soon. You can add yourself to the wait list to be notified when it is released in Australia, Europe and Asia. You may be able to get round this with a fast VPN on your Mac although the latency will probably make it too slow for the service to work properly. The free beta version is limited to 4 hours of gameplay after which it kicks you out. In-game voice chat is not supported in the beta but you can use Discord for Mac to chat with friends instead. It only currently works with games on the Steam platform but this would surely be expanded if the beta is successful. There are some glitches and bugs with certain games which you can report or read about on the GeForce Now Mac forum. You will find that games take a while to boot – sometimes as long as 3 minutes or so but usually a lot less. This will improve as the product develops out of beta but the gaming experience is worth the wait. There’s no GeForce Now app available for Apple TV although in theory, it should be possible in the future because the main requirement is a fast internet connection since everything is hosted in the Cloud. Currently, the following Gamepads are supported by GeForce Now on Mac. Note that Logitech Gamepads only work in DirectInput Mode. You can use an XBox controller with GeForce Now but it’s complicated to setup. You can find instructions here or you may be able to use an app like Joystick Mapper which makes it much easier. There’s no official word on this but in theory GeForce Now should work with SteamVR on Mac. The problem at the moment is that there are no SteamVR games for Mac yet but that should quickly change now that High Sierra supports VR headsets on Mac. this does not work. i asked for geforce now and gave them my email.. the code never came. You will only receive a code once GeForce Now For Mac is available in your region or when they release more invites for your region.